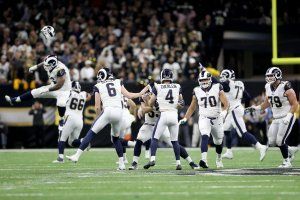 NEW ORLEANS, LOUISIANA - JANUARY 20: Johnny Hekker 6 and Greg Zuerlein 4 of the Los Angeles Rams celebrate after kicking the game winning field goal in overtime against the New Orleans Saints in the NFC Championship game at the Mercedes-Benz Superdome on January 20, 2019 in New Orleans, Louisiana. The Los Angeles Rams defeated the New Orleans Saints with a score of 26 to 23. NEW ORLEANS - Greg Zuerlein kicked a 57-yard field goal in overtime and the Los Angeles Rams, helped by a huge missed call by the officials, advanced to the Super Bowl with a 26-23 victory over the New Orleans Saints in the NFC championship game Sunday.